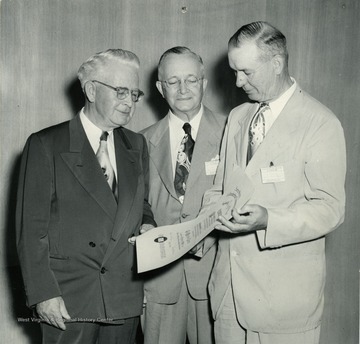 Candid portrait of W.T. 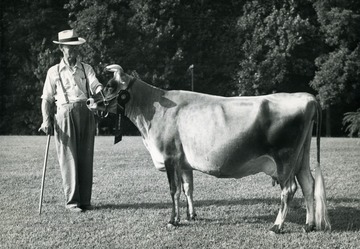 Law and his Jersey cow which won the Grand Champion over all Jerseys' at the West Virginia State Dairy Show, Jacksons Mill, 1951. The cows name is Wonderful Bindle Joy. Picture taken in Harrison County. 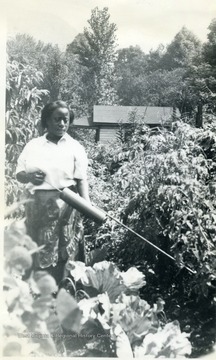 Woman spraying a garden for insect control in Kanawha County. 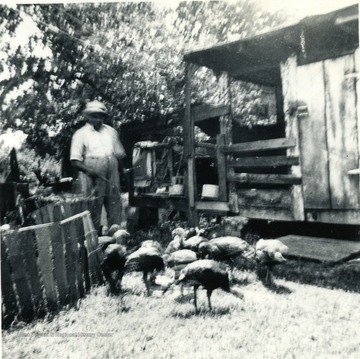 Man and turkeys, part of the Homemaker Turkey Project in Kanawha County. Money made from this project was used to purchase a new kitchen sink. 4. 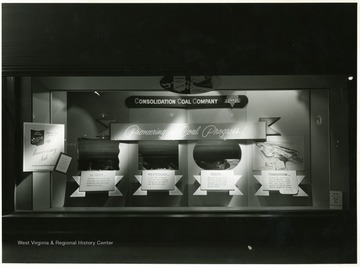 Consol's Exhibit at Hornes Department Store, Pittsburgh, Pa.
Consol's Exhibit at Hornes Department Store, Pittsburgh, Pa. Display of Consolidation Coal Company shows the different mining techniques throughout the century and beyond. 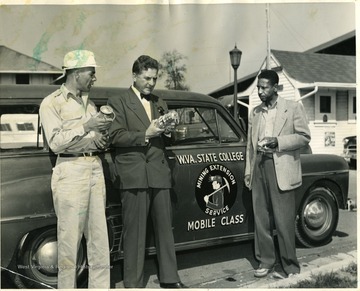 Three men inspecting lanterns next to a W. Va. State College Mining Extension Service Mobile Class car. 6. 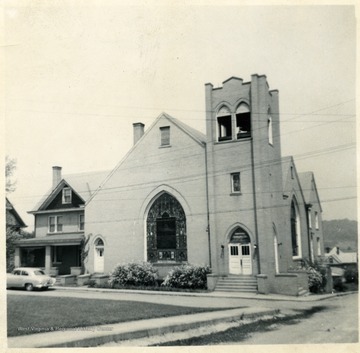 Church in Westover, W. Va.
Church in Westover, W. Va.
7. 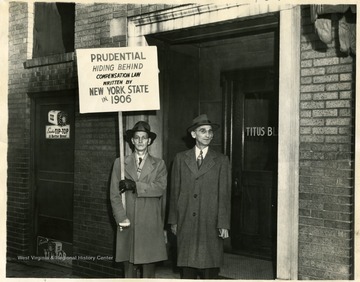 Picketing Prudential, Morgantown, W. Va.
Picketing Prudential, Morgantown, W. Va.
8. 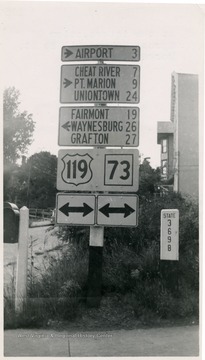 Highway Signs at the Intersection of Spruce St. and Willey St., Morgantown, W. Va.
Highway Signs at the Intersection of Spruce St. and Willey St., Morgantown, W. Va.
Highway signs to the airport, Cheat River, Point Marion, Uniontown, Fairmont, Waynesburg, and Grafton at the Intersection of Spruce St. and Willey St., Morgantown, W. Va.
9. 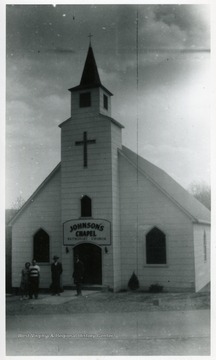 Johnson's Chapel Methodist Church, Monongalia County, W. Va.
Johnson's Chapel Methodist Church, Monongalia County, W. Va.
10. 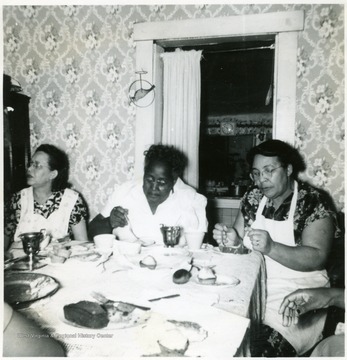 Homemakers Testing Products, Kanawha County W. Va.
Homemakers Testing Products, Kanawha County W. Va.
Three African-American women participate in a Make Your Own Mix demonstration. 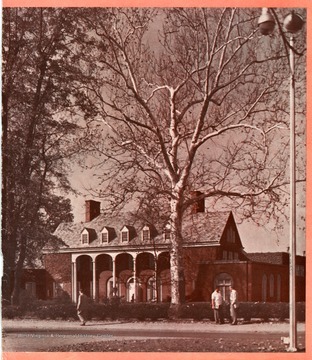 View of Elizabeth Moore Hall in West Virginia is shown on the cover of West Virginia University Alumni Magazine, Volume 16, Number 3, Winter 1951.